Find My Workspace lists over 95% of the serviced offices market in North Jakarta. Simply click Request Quote to check pricing for one office, or Add to Basket for multiple offices. The business centre offers high quality serviced office space, and is located in the newest building in Sunter, North Jakarta. 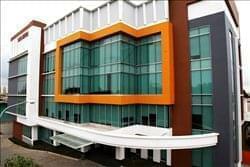 This is the most strategic business area in North Jakarta between Kemayoran and Kelapa Gadin. This area is home to many major automotive, finance, trading and shipping companies. To obtain information for your selected North Jakarta Serviced Offices, please tick the "Add to basket" box for each office you prefer and complete the form below. We will then send a detailed report via email.